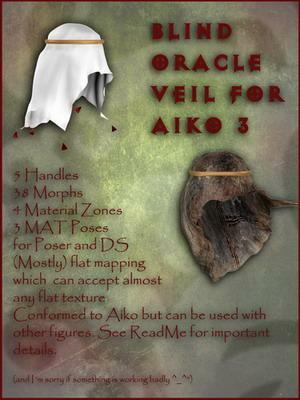 Conforming cloth for Aiko 3 (A3 Realistic morphs is included) but can be used with other characters too. Can be use even for non blind characters with tweaking of morphs. Important details, known problems and tips of usage are provided in the ReadMe, please read. You can make commercial or non-commercial renders with it but you can't redistribute it, make a derivative work from raw content of the pack (mesh, textures, cr2 and so on) or claim it as your own. Due to changes in Second Life EULA as on October 2013, the use of this content in Second Life in any shape of form is especially prohibited. In a few minutes, I will add a close-up render of the veil on V4.2 to this upload's image list. Would this be OK? Thanks! TheBlindBat (12 years ago) Inappropriate? This is an awesome freebie! Thanks!